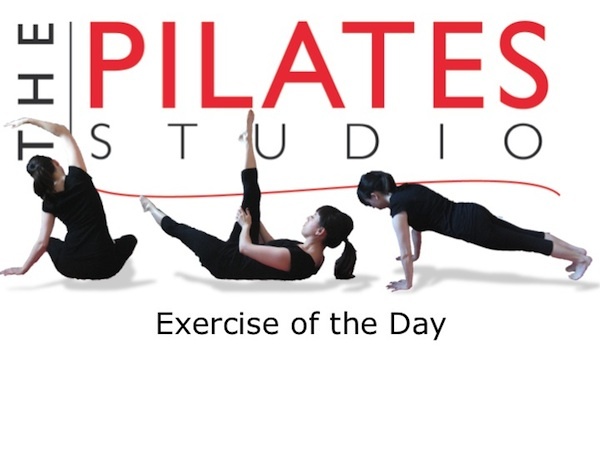 This exercise is a classic variation of the Pilates Classic The Hundred. It is the advanced variation that increases the distance of the lever arms of the legs away from the stabilizing core. To do this exercise you will need a mat. 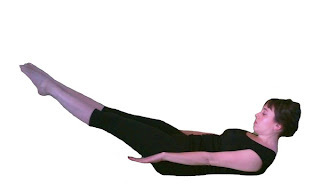 Start by lying on your back with your legs straight in the air above your hip sockets. Squeeze your inner thighs together as you allow your arms to float up over your shoulder sockets. Then exhale as you press your hands down to the ground and lift your head, neck, and shoulders into the air. Continue the exercise by taking five short inhales and then as you begin your five short exhales, lower your legs closer to the ground. Continue the breath pattern as you lift your legs back into the air on the inhales and lower the legs towards the ground on the exhales. To finish release your head, neck, and shoulders to the ground as you hug your knees to your chest. If you have osteoporosis this is not the exercise for you, but you can visit The Pilates Studio’s weekly blog and find many bone building workouts in the October 2012 posts. This exercise requires quite a bit of strength in the lower abdominals. Be sure to keep your sacrum glued to the ground as you lower your legs. It will be helpful to make sure that you are exhaling all of the air out of the lungs. This will allow you to find length in your low spine so that it can support the additional weight of your legs as a longer lever arm.